Zoom is coming. Harry wants to re-create the particle accelerator. And Barry is stuck in the middle, trying to make the best decision for himself and the world. (Okay, maybe just Central City right now.) What will Team Flash do to stop Zoom from taking over? Let's find out! Harry is, of course, unimpressed with all of it. He says the hologram can only last so long before people start to realize the Flash isn't really there. He pushes for re-creating the particle accelerator to get Barry's speed back. The rest of Team Flash is hesitant because of what happened the last two times they turned on the particle accelerator. Harry says he has everything he needs to recreate Barry's speed. It's the only way to save Caitlin. Barry visits his dad. Henry is living in a log cabin in the middle of the woods. Barry tells his dad about Zoom and about losing his speed. (Also, Garrick is Henry's mom's maiden name. Is there a connection? Even on Earth-2?) At STAR Labs, Team Flash goes over simulations for the particle accelerator when Cisco vibes. He sees his brother. He decides to leave just as Barry brings Henry to STAR Labs. Cisco: "It looks like the Vacuum." Jesse: "Uh, what's the Vacumm?" Cisco: "No Fringe on Earth-2. Noted." Joe and Wally are at the CCPD precinct. Wally has been rethinking his life purpose--maybe designing cars isn't enough. Zoom shows up with Caitlin and confronts the police. Caitlin tries to talk Zoom out of killing anybody. Surprisingly, it works. Zoom lets them leave, but he gives them a threatening warning: obey him or die. (Duh-duh-DUN!) Joe goes back to STAR Labs to inform Team Flash of Zoom's appearance and takeover. Harry says this is the beginning of Zoom's plans--it's the same thing he did on Earth-2. Harry says the only way to stop him is to get Barry's speed back. Joe locks Wally and Jesse in the secret room at STAR Labs to keep them safe from Zoom. Harry works on science-y stuff to prepare the accelerator. Joe and Henry talk to Harry about Barry and this decision. (Look at all these dads worried over our little Scarlet Speedster.) Barry overhears their discussion, and he tells them that it's his decision and his alone. Barry: "I know that you care about me, each of you, in your own way, and you all have your own point of view on this, but this decision is mine. I have to make it on my own." Rupture: "You killed my brother, so now you die." Cisco: "Oh, my God. You are Princess Bride-ing me right now! You must have me mixed up with somebody else, Inigo." Iris talks to Barry about his decision. She doesn't want him to get hurt. She also tells him about how she's been dwelling on the idea that they are meant to be together. She says it doesn't matter to her if he's the Flash or not; she only wants Barry as Barry. At the precinct, Caitlin manages to find a cellphone to use. She overhears Zoom talking to Rupture. Zoom orders Rupture to take care of the police, who are holed up in Jitters. Caitlin talks to Zoom about his decisions and changing his voice--she asks if he does it so people will think he's a monster. Zoom has another flashback, says he is a monster, and leaves. (Hmmm...) Caitlin texts STAR Labs about Rupture's attack. After receiving Caitlin's warning, Barry makes his decision: he can't set off the particle accelerator. They have to stop Zoom some other way. Caitlin: "Is that why you change your voice, so that everyone will be afraid of you?" Zoom: "As you once said, 'I'm nothing but a monster.'" Joe warns the police, and they set up a trap in Jitters. Rupture arrives. Barry runs inside a STAR Labs vehicle to simulate the Flash in order to distract Rupture. Meanwhile, the police taze him and restrain him. However, Zoom hears about the trap and learns Caitlin notified the police. He gets very, very angry and goes to Jitters. He zooms around the room and knocks everybody down, killing them. He only leaves Joe and the Chief alive. Barry runs in to stop him, but Zoom kills Rupture also. (I'm not surprised. He likes to kill his minions. Poor Cisco.) Then he warns Central City that the Flash is a fake--a hologram. He says there is no one left to protect the city. He threatens the police and says they're only alive because of Caitlin. But he says it won't work again. Then he zooms away. Zoom: "There is no more hope, there is no more Flash, there is no one left to protect your city ... from me." They return to STAR Labs. Cisco finds his brother, and Dante starts to apologize. Cisco just gives him a long hug and says he wants things to change between them. (This was so sad for Cisco, but I'm glad he's reconciling with his brother.) Jesse and Wally are still in the secret room. Wally says they should be helping outside, so Jesse figures out a way to open the locked door to get out. Cisco and Harry prep the particle accelerator. They've figured out a way to contain the dark matter, and they're going to use Cisco as a lightning rod to re-create the night Barry was hit by lightning. 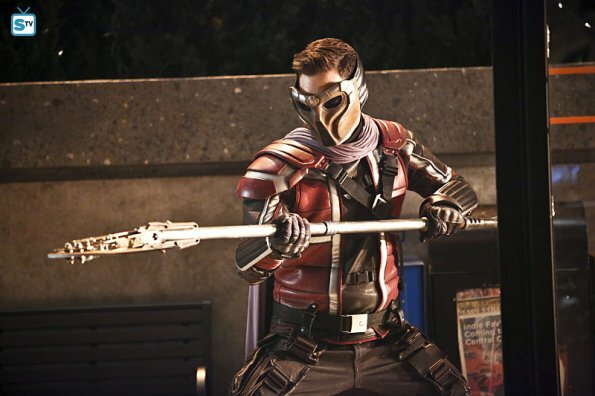 Using the weather wand, Cisco creates a storm above STAR Labs. Barry gets into the containment cell for the particle accelerator. Iris tells him no matter what happens, it won't change how she feels. Henry tells Barry he doesn't have to do this, but Barry says the Flash is the best version of himself; this is the only way to bring that version back. Barry: "Being the Flash, that's the best version of me. If I don't have my speed, I'll never be that person anymore. I have to do this." Zoom sees the lightning from the precinct and races over in a fury. Cisco returns to the ground floor. The containment cell opens--it's empty. Zoom comes in and picks up what remains of the Flash suit. He tells them they've killed the Flash. Zoom: "You thought you could give The Flash his speed back? Well done. You killed him instead." Zoom was super creepy and intriguing as ever when he talked to Caitlin. I'm curious to see where his so-called "affection" for Caitlin stems from. Does he actually have a heart? Or is it some other kind of tendency of his? I still feel his flashbacks are messing with his head so much that there's going to be more to him than just evil, bad guy villain. We'll see. The end was shocking. I couldn't even process what happened for a good while. I just sat there thinking "What? WHAT? NO." I know Barry can't be dead, but I don't know what happened to him either. I don't know how Team Flash is going to bring him back. And frankly, this is exciting stuff. I'm glad I don't know. This show continues to surprise and amaze me. Also, I'm super stoked to see if Wally and Jesse might become speedsters. There are obvious hints that they will. I need the next episode now! What did you think of "Rupture"?